1Lt Richard L. Kruse (IP) - An original 358th BS crewman. Flew as CoPilot with the Capt Robert L. Nolan crew on 20 credited missions. Upgraded from CoPilot to Pilot on 4 July 1943 and flew six credited missions as an Instructor Pilot with 1Lt John W. Hendry, Jr. as CoPilot. Combat tour completed on 26 July 1943. 1Lt John W. Hendry, Jr. (P) - Took over the 1Lt Kruse crew as Pilot following mission #54. Became a POW on mission #79, 20 October 1943. 2Lt Calder L. Wise (CP) - Flew 15 missions as the 1Lt Hendry crew CoPilot - 1st mission #56 on 30 July 1943, last mission #74 on 4 October 1943. Upgraded from CoPilot to Pilot on 8 October 1943 and flew 10 missions as First Pilot. Twenty-five mission combat tour completed on 6 March 1944. S/Sgt Olwin C. Humphries (BTG) - KIA on mission #56, 30 July 1943. Shot through the right lung and side. Body brought back to Molesworth. S/Sgt Howard L. Abney (TG) - Wounded on his 13th mission, #61 on 19 August 1943 by 20mm shell fragments in his right hip and arm. Was taken to the 12th Evacuation Hospital and removed from combat flying. 1Lt John W. Hendry (CP)(POW), 2Lt Bernard T. McNamara (N)(POW), 2Lt Richard L. Webster (B)(POW), T/Sgt Loran C. Biddle (E)(POW), T/Sgt James J. 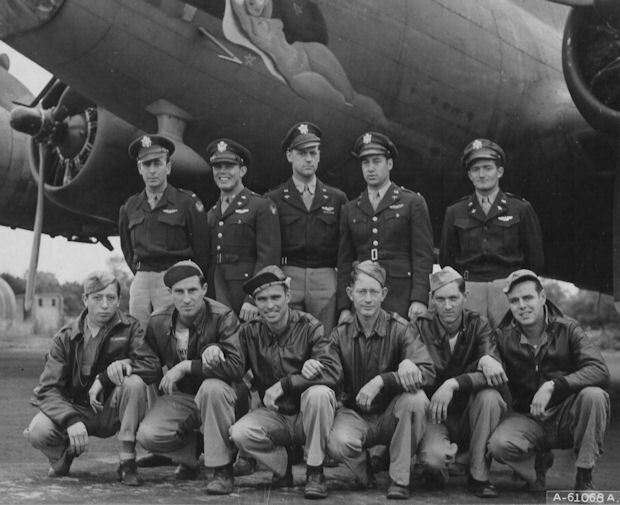 Brown (R)(KIA), S/Sgt John J. Doherty (LWG)(POW) - Mission 79, 20 October 1943 to Duren, Germany. B-17 downed by cannon shells from a German ME-109. S/Sgt John Arasin (RWG) - Twenty-five mission combat tour completed on 5 Nov 1943. Flew on both Schweinfurt missions.